Sales of luxury properties have hit a sluggish patch in recent weeks. That is according to industry players who said that the segment has underperformed despite the overall property boom last year. Analysts said most buyers of luxury properties, who are mostly foreign investors, are turning cautious about buying their next multi-million-dollar home, due to the uncertain global economy. Hamilton Scotts, for example, has seen slow sales, despite being one of the most anticipated super luxury properties to be launched in the last three years. Out of the 56 units in the property, only 19 have been sold at between $3,000 and $3,700psf. The freehold property was launched in mid-2008, in the heat of the global financial crisis. Sales of similar luxury properties have also been slow, with the exclusive development 8 Napier selling 27 out of the total 46 units. Its latest transaction was in April at $3,000psf. Hamilton Scotts was developed at a cost of more than $100 million and it features a $20 million en suite car porch. Each unit is selling at between $8 million and $10 million or an average of $3,800psf. Hamilton Scotts developer KOP Properties said luxury property buyers have been cautious with their cash. "I have not shown people - the buyers and consumers - what this project really looks like. I think people are unsure about the car porch mechanism so I think we really need to show them the entire thing and to be able to fully showcase all the wonders of this project," said Ms Leny Suparman, chief executive officer of KOP Properties. "For the past 3 years, despite the fact that we didn't have a show flat and we have been selling very well off the floor plans and the sales gallery in our office, I think we have done very well," said Ms Suparman. Mr Liang Thow Ming, head of residential services at Credo Real Estate, said sales of luxury properties tend to be slower when compared to mass market home sales. "If you look at properties of these price tags somewhere in the region of $8 million to $10 million, you don't expect these units to fly off the shelf anyway, so I think the pace of sales at Hamilton Scotts is comparable to the general luxury market," said Mr Liang. But analysts said the luxury property segment will cool off further, after recovering slightly last year from the property downturn during the global financial crisis. In the last three quarters, prices of uncompleted non-landed core central region homes - which include most luxury properties - grew by 3%. This is a much slower growth compared with the 26% increase in prices in the whole of 2007, during the last property boom. 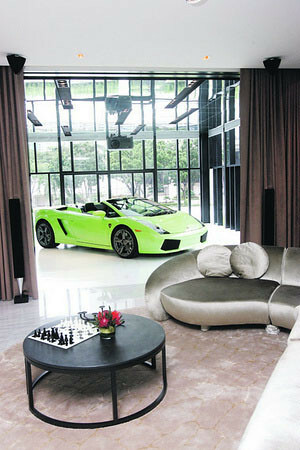 It does look kinda cool to have your Ferrari/Lamborghini next to your living room. But practically speaking, it may not be such a good idea as you never know what those tires might have rolled over (image of a dead cat comes to mind somehow). Haing said that, if one has that kind of money to splurge on Hamilton Scotts, he probably will have a servant dedicated to cleaning the car tires alone! Despite the slow sales at its high-end Hamilton Scotts condominium, luxury property developer KOP Properties will not lower its price for the Scotts Road project. Instead, the company will hold out for buyers who are prepared to pay for quality properties, said chief executive Leny Suparman. In a telephone interview with The Straits Times last week, she expressed optimism about the luxury home sector. "The only way prices can move is up," she said. "If there are two to three more luxury property launches this year, it will start the trend and people will want to come in and get a slice of the action too." While prices in the mass market segment have recovered substantially, luxury property prices are still 20% below the pre-crisis peak, Ms Suparman saod. "There needs to be this momentum for the ultra-luxury segment as well - it will be positive for the overall market," she said. "There are lots of people with money but when it comes to selling such properties, I believe you need to be able to feel the space before you can decide whether to buy." Ms Supraman was speaking after a KOP Properties unit, Hayden Properties, held a "topping out" ceremony for Hamilton Scotts recently. This marks the final pouring of cement at a property project before completion. The 30-storey, 54-unit ultra-luxury condo is expected to be completed in the fourth quarter of this year. No Comment to " Luxury property market: Signs of weakening? (Updated) "